Tyron Woodley is no longer the UFC welterweight champion. After a lengthy reign atop the division, he was dethroned by Kamaru Usman at UFC 235 earlier this month, giving up a unanimous decision after five grueling rounds of action. After such a lengthy time as champion, returning to the welterweight contendership race has understandably been a difficult adjustment for Tyron Woodley. The former champion discusses this difficult process in a recent interview with Mike Bohn of MMA Junkie. “It feels weird,” he said candidly. “When you said ‘former champion’ I wanted to turn around and just kind of [mean] mug you a little bit. But you know, it’s a part of the game. “You never know when you’re going to get another chance at the world title, so when you get to that point and you get defeated, it’s a crushing feeling,” he added. “I’ve given that feeling to a lot of fighters. Tyron Woodley also reflected on the loss to Usman itself. He maintains that he didn’t feel like himself in the cage. With this tough loss to Kamaru Usman behind him, Tyron Woodley admits he’ll have to return to the drawing board and reassess his goals for the immediate future. 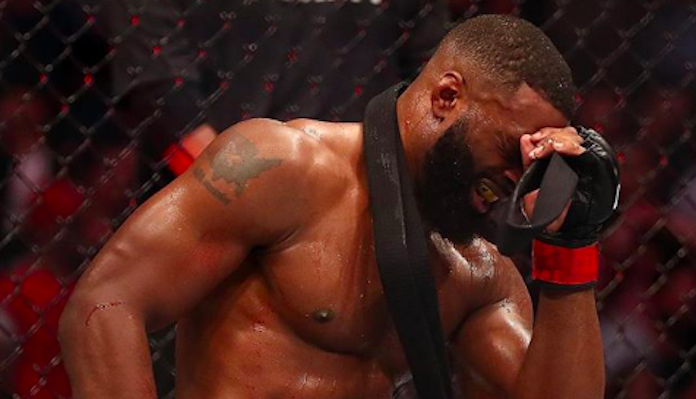 What do you think the future holds for Tyron Woodley after his loss to Kamaru Usman at UFC 235?